Perhaps Mell is getting the term mixed up with ‘scallion’? Mr. Wells, you’ve done an admirable job of osmotically absorbing the first year of Narbonic and reassembling it in this conversation. So many events and motifs are recognisable! My face, he is egg’d. Reading through the archives, it took me until somewhere around Part 15 of this to realize the title was a pun. Incidentally, I love verbose!Artie. Also the last picture here. Scraps was always one of my favorite Oz characters. 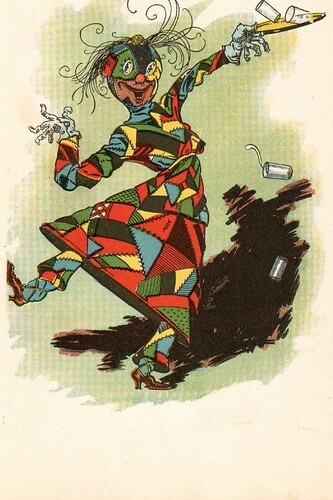 And The Patchwork Girl of Oz is one of the best books. Y’know, I have always wondered exactly what Mell thinks a scullion is. Yogurt containers are not recyclable, to my enternal dismay. Ed: I’ll match your weasel queen, and raise you a trilobite. I’ll see that trilobite, raise by a Brass Octopus with a Parasol, and call! Eyeharvester: I would put money on her mental picture including heaps of skulls. I’ve tried planting seedlings in yoghurt containers, and I still end up with too many left. Can’t recycle them here, either. I felt bad in retrospect having Artie eat the cheese, as I later learned he identified at “vegan”, rather than “vegetarian”, but then I realized he’s not consistent about this himself (c.f. the egg he asks for during the Class Reunion storyline.) And yes, I do think too much about this sort of thing, why do you ask? Capitalist Yogurt is a good name for a band.